We continue our hard work in the classroom this week. 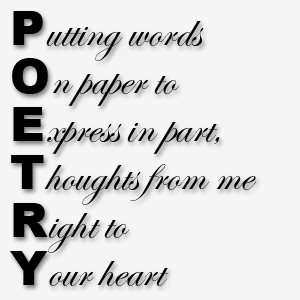 I am especially excited because we begin our poetry unit this week. At the end of this unit, there will be a big celebration called Poetry Cafe, in which the students will share all of the poems they have written. Please also read the research papers your children wrote in the Tuesday folders. I was very proud of their hard work. Reading/Writing Workshop: This week the students will not only define poetic terms, but they will be immersed in famous poetry. Some poets we will learn: William Shakespeare, Edgar Allen Poe, Emily Dickinson. In addition, each student will write a poem in the authors’ style. Poetry test: Thursday. Spelling Words: The spelling/vocabulary words this week will be poetry terms! consonance, exaggeration, haiku, hyperbole, line, meter, nursery rhyme, assonance, alliteration, cinquain, epitaph, homonym, homophone, imagery, metaphor, narrative poem, ballad, acrostic, couplet and accent. Test this Friday. Science: This week, we will begin our new unit on rocks and minerals. How can you tell different rocks apart? Is a rock a biotic or abiotic factor? Social Studies: What a wonderful study we had on the Civil Rights movement. Your children did a great job researching famous African Americans that made a difference in our country. This week, we will learn about the Vietnam War. What caused the Vietnam War? Theology: This week, we will finish our unit on the order of the Mass. There will be a test on Wednesday. Students must put 24 items in order beginning with the Liturgy of the Word and ending with the Liturgy of the Eucharist. 4th Grade Social Studies: This week we will continue learning about the Civil War. Our focus will be on Harriet Tubman and the Underground Railroad as well as creating Underground Railroad quilt squares that determined the routes that slaves took to freedom. Quiz Thursday. 6th Grade Social Studies: This week we will end our Dark Ages unit by studying the Medieval manners at the dinner table. How have manners and etiquette changed? What can the use of etiquette determine about a person? Test on Dark Ages: Friday.